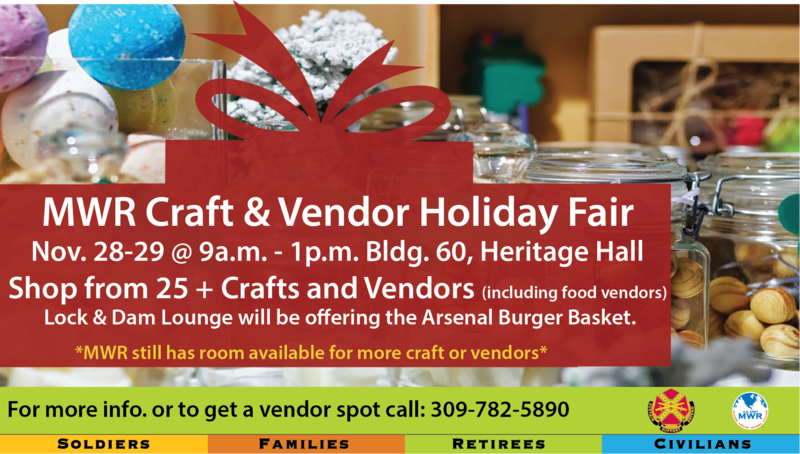 Date: Nov 28 2018, 9 a.m. - 1 p.m.
Come see all the fun and unique items at the annual MWR Holiday Vendor Fair. Get a head start on all those holiday shopping lists. This two day fair runs from 9 a.m. to 1 p.m. each day and features 25+ vendors including food vendors. The Lock and Dam Lounge will also be offering Arsenal Burger Baskets so you can eat lunch while you browse. We still have room for more vendors so please call +1 (309) 782-5890 for more info or to sign up for a table.